Map Beautiful Pencil Portraits of your Pets and Loved Ones. Looking for a unique, yet affordable, gift idea for someone special? Or would you just like to treat yourself? Yorkshire artist, Kate Hargrave, can create a stunning portrait of a treasured pet or family member from your favourite photographs. All too often, gifts get stashed in drawers or under beds and forgotten about.... 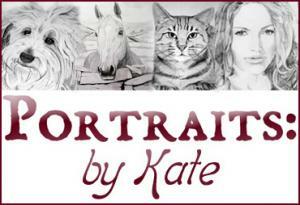 Drawn on quality, acid-free Bristol Board paper using various shades of graphite pencil, a portrait by Kate is a lasting gift that you can proudly display, share and enjoy every day. Simple pricing and a personal, flexible service make commissioning a portrait a fun and hassle-free experience. Delivery within 14 days is typical and satisfaction is guaranteed.